Was walking through Target the other day and came across the duct tape section. There were so many patterns and colors that I was inspired. The only thing that I could think of what to do with it was agility equipment. And none of the dogs at my house have any desire to do agility. 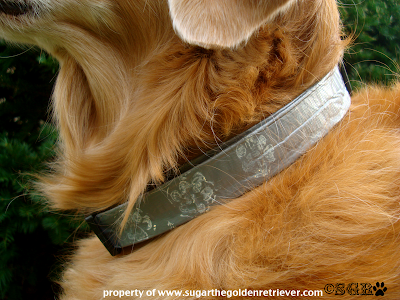 Then I happened to stumble upon Sugar The Golden Retriever's blog and came across Duct Tape dog collars. A cute, fun and simple idea to add some style to spring. Counting Down To Valentines Day . . .
and wondering what I was going to do. I am a broke girl. And right now I am a broke girl with a totaled car that still wants to celebrate the holidays with her pets. Because if they feel good, I feel better. So I started to look around to see what I could do with minimal sewing skills and spending a ton of money. And it turns out to thanks to craftstylish it turns out to be quite a lot. Thanks to the tutorial I am going to be able to make two pretty good toys on the cheap. There are instructions for a stuffed Conversational Heart Pillow, which I really like since it is really versatile. I can make it in any size, so it would be good for a pillow or a toy. Or I could leave out of stuffing for a more shakey type of toy. Or even put some catnip in it for a certain cat that I know. Toy Number Two in the tutorial is a Tennis Ball Tug. With tennis balls of all sizes that are available, another great toy for dogs of all sizes. And you could use any material. It is shown with polar fleece, however I have an old pair of jeans with holes in them that I am thinking might work for my guys.